PartsBadger is Hiring a CAD Estimator / Drafter - Apply Today! PartsBadger is seeking a CAD Drafter/Estimator to collaborate with a small team of people dedicated to the success of our customers. This role will review drawings and quote projects, as well as, prep projects for production. You will be responsible for independent tasks and collaborative projects. An ambitious, yet humble, person will succeed in this role. If you or others perceive you as arrogant or defensive, perhaps this isn’t the role for you. PartsBadger is a relaxed, casual work environment located in a Cedarburg, WI. Our location boasts 15,000 sq. ft that blends office and production space. We continue to develop the layout of our office for idea generation and collaborative work. PartsBadger offers a competitive compensation package with the opportunity for professional advancement. This position is structured to allow for advancement in a variety of areas, with flexibility to try new things and challenge your mental boundaries. PartsBadger understands the value of our team and we work hard to nurture creativity and engagement. Are you ready to challenge yourself, challenge our industry, and adapt to change? Can you accept a feedback loop and decide to pivot or persevere? Apply today for the opportunity to become part of a collective group of people that are Fast, Innovative, Responsive, and Friendly. PartsBadger was founded by Tech Entrepreneurs and has the goal of disrupting a multi-billion-dollar industry using creative yet effective new-age business techniques. 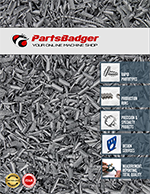 PartsBadger wants to change the way people and companies source their custom parts. We believe the ability for humankind to innovate shall not be limited by the ability to make. To advance the innovation of others through simplified, responsive, and efficient manufacturing. Email your resume to ashley@parts-badger.com. Include the position you are applying for and tell us why you think you are a good fit for the position.